We’d love your help. Let us know what’s wrong with this preview of The Ultimate Unauthorized Eragon Guide by Lois H. Gresh. In Christopher Paolini's thrilling Inheritance series, when a young boy named Eragon finds a blue gemstone in the middle of the forest, he has no idea what magic is in store for him. It hatches a sapphire-blue dragon, a member of a race thought to be extinct. Eragon bonds with the dragon and soon discovers that he is the first in a new line of Dragon Riders, fated to play In Christopher Paolini's thrilling Inheritance series, when a young boy named Eragon finds a blue gemstone in the middle of the forest, he has no idea what magic is in store for him. It hatches a sapphire-blue dragon, a member of a race thought to be extinct. Eragon bonds with the dragon and soon discovers that he is the first in a new line of Dragon Riders, fated to play a part in a war that is poised to sweep his land. 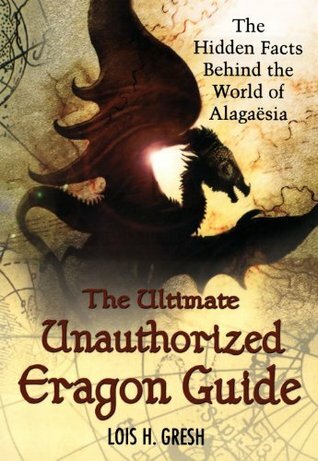 To ask other readers questions about The Ultimate Unauthorized Eragon Guide, please sign up. It has a slow start but the moment I got into it the journey that it took me on I can not even put into words. Honestly while reading this book I got some ideas for my short stories (I was stuck to chapter 8 for a long time), because the writer will give you so many details about the fantasy and where it came from. Some of the things i was not even aware that my country is responsible for the creation of those creatures (witch white or dark). If you truly love fantasy (any kind, from YA, Urban It has a slow start but the moment I got into it the journey that it took me on I can not even put into words. Honestly while reading this book I got some ideas for my short stories (I was stuck to chapter 8 for a long time), because the writer will give you so many details about the fantasy and where it came from. Some of the things i was not even aware that my country is responsible for the creation of those creatures (witch white or dark). I stopped twenty pages into this. It was horrible - she goes off on tangents that have absolutely nothing whatsoever to do with Eragon, some of which is stuff I really didn't want to hear either way. And besides...only half the series is out so far! Why is she trying (and failing!) to write an "ultimate" guide? Don't even bother cracking the cover. I didnt like this book. The author made assumptions and guesses based on her knowledge and not the characters and authors knowlege. It was well written though.